Rosacea is a common condition, especially in adults who are fair-skinned. The disorder is caused by a dysfunction of the skin’s immune system. Rosacea is identified by inflammation and irritations of the skin, which vary widely from person to person. Adults between ages 30 and 60 are more likely to develop rosacea, but it can affect anyone. Sometimes referred to as “adult acne,” rosacea is actually a different condition. The disorder commonly appears as flushing or redness of the cheeks, chin, nose or forehead. It can also occur on the scalp, ears, neck or chest. Depending on the type of rosacea an individual has, he or she may experience temporary symptoms that come and go, or persistent evidence of the condition. Choose a dermatologist at Ascension Seton for your rosacea treatment. Find a doctor or find a location near you to take the next step. Rosacea is a chronic condition that is often marked by a pattern of flare-ups followed by remission. The cause of rosacea is not known. Though there is no cure, steps can be taken to manage symptoms and control the disease. There are a range of environmental and lifestyle factors that can cause symptoms. Heat, sunlight, alcohol, spicy foods, strenuous exercise and stress are common factors that aggravate rosacea, though each person has his or her own triggers. Certain medications, such as corticosteroids or blood pressure medications, may cause flare-ups. Minimizing or avoiding these triggers can help individuals better manage the disease. 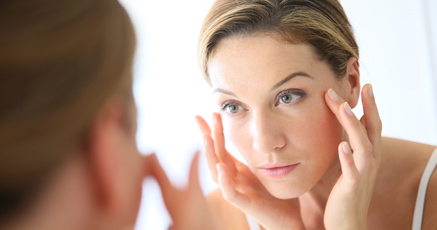 Daily skincare routines can help to reduce flare-ups. Wear sunscreen of SPF 30 or higher each morning, and re-apply during the day when outdoors. Sensitive skin is common for people with rosacea. Using gentle, non-medicated cleansers and creams is an important part of the skincare regimen. There are four types of rosacea that can be diagnosed. Many patients experience symptoms of more than one at the same time. Subtype 1: This form of rosacea produces flushing or constant redness, which may include visible blood vessels. Some people also experience stinging or burning sensations. Subtype 2: This form of rosacea shows up as bumps and pimples with red patches of skin. Subtype 3: Skin thickening is caused by this type. Excess tissue forms on the nose and causes it to become enlarged. Bump-like lesions may also appear. Subtype 4: This less common form of rosacea causes eye irritation. Symptoms include recurrent sties, swollen eyelids, tearing, watery or bloodshot eyes, and a burning sensation. The most effective treatment depends on the type of rosacea diagnosed. Early diagnosis and treatment results in better management and a reduction in symptoms or complications. Though length of care depends on how serious the symptoms are, long-term medical treatment may be necessary. Most people with rosacea benefit from a combination of treatments. A number of topical treatments exist for rosacea, including antibiotics. Creams or gels can reduce redness and inflammation. When rosacea doesn’t respond to topical treatment, various oral medications are available. Your dermatologist may prescribe antibiotics in pill form. The most common of these are doxycycline and minocycline. Acne drugs such as Accutane™ can also be used to treat stubborn rosacea, helping to clear up lesions that form during flare-ups. Light-based treatments such as Intense Pulsed Light (IPL) can be effective for long-term treatment. Laser or light-based treatments help to slow buildup of excess tissue and reduce appearance of blood vessels. Rosacea can cause long-term changes in some cases. Blood vessels can become permanently enlarged and remain highly visible, or tissue around the nose thickens and alters your appearance. Laser or electrosurgery can address these issues to reduce blood vessel visibility and remove tissue buildup. Unlike acne, there is low risk of rosacea causing scarring. The most important consideration is to minimize the triggers that can result in flare-ups. For people who regularly use topical treatments or take oral medication, there are no aftercare instructions. After laser or light treatment, skin may be slightly swollen or red. Symptoms can feel like a sunburn, but ice packs can soothe the side effects. Patients are advised to avoid direct sun exposure of the treatment area for several weeks and not exercise for 24 hours.